Main Sources: Rosen, Philip & Cecil Schwalbe, 2002, "Widespread effects of introduced species on reptiles and ambhipbians in the Sonoran Desert region," in Tellman, Barbara, ed., 2002, Invasive Exotic Species in the Sonoran Region, Tucson: University of Arizona Press and the Arizona-Sonora Desert Museum, pp. 220-222; Budiansky, Stephen, 2002, The Character of Cats: the Origins, Intelligence, Behavior, and Stratagems of Felis silvestris catus, NYC, Viking Press; Warren Johnson et al, 2006, "The late Miocene radiation of Modern Felidae", Science 311:73-7; O'brien, Stephen, & Warren Johnson, "Evolution of Cats", Scientific American July 2007, pp. 68-75. Knowledge of the evolution of cats (family Felidae) has expanded rapidly with the application of genetic analyses, the latest and most systematic of which (Johnson et al, O'Brien & Johnson, cited above) confirms a division into 8 major lineages into which all 38 identified living species can be fit. Of these 8 lineages, the final divergence, which occurred some 6 Ma, was a line that includes today's Asian leopard cats and various wild cats of Eurasia and Africa, which in turn split into two lineages, the Leopard Cat lineage and what Johnson et al. call the Domestic Cat lineage -- since this line led first to European Wild Cats (Felis sylvestris) and finally to our own domestic Felis catus (a representative of which is shown both at the top and bottom of this page). Both of these lineages had ancestral roots in North America, but crossed the Bering Straits land bridge several million years ago, during the Pliocene Epoch. While these divisions and dates may be regarded as somewhat provisional, it seems clear that our North American Bobcat -- which has a physical appearance quite similar to some of our domestic cats, is, as a member of the Lynx lineage, actually more than 7 million years removed from the above two felid lineages genetically. In 2002, Stephen Budiansky (cited above) observed that professional zoologists cannot reliably distinguish the skeletal remains of the domestic cat, European Wild Cat, and African Wild Cat, and he argued that the separation of these species might go back no more than about 2000 BCE, though by current knowledge, the oldest archaeological find of a small cat in burial association with humans dates back to some 7,000 BCE, on Cyprus. 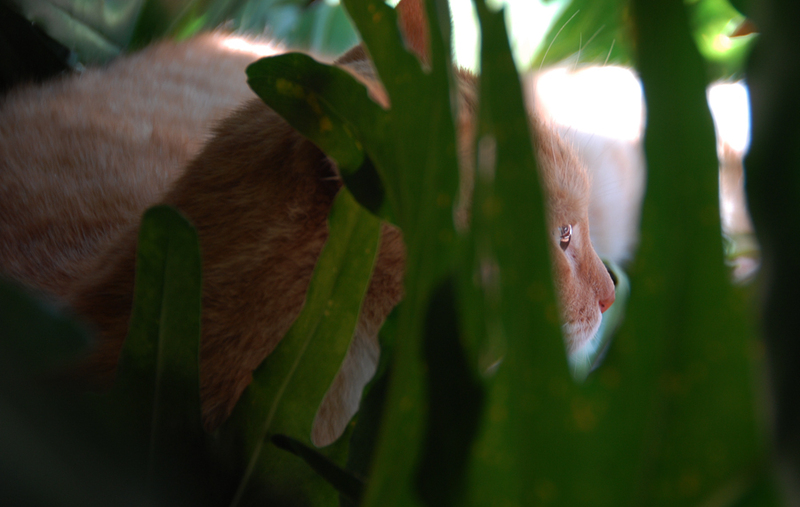 Budianski provides an image of an African Wildcat that looks remarkably like the Orange Tabby shown above, except for somewhat darker striping. So if we class domestic cats in their true lineage, we might call them Wildcats, but then Bobcats should not be so called. In view of the new information provided by O'Brien & Johnson, the separation between domestic cats and their European and African cousins may be considerably older than Budiansky suggests, but the main point for our interests here is that the similarity in appearances between our domestic cats (and their European and African Wildcat cousins) and the bobcat is deceptive, genetically speaking, though they do share some significant similarities in behavior, for example their solitary nature. Therefore it would seem that our "Bobcats" should not be called "Wildcats". Regarding the origin of domestic cats, O'Brien and Johnson (cited above, pp. 74-5) say, "We now believe that the cat was domesticated on several occasions, all within the fertile crescent 8,000 to 10,000 years ago, as nomadic human populations began to gather together in small villages around the first agricultural settlements. These early farmers cultivated wheat and barley. Wildcats in the region, perhaps attracted by the plentiful rodents in the grain stores, apparently offered themselves as cautious companions, earning their keep by dispatching the pesky rodents. The increasingly tame wildcates bred prolifically and linked their fortunes to those of the humans." Rosen & Schwalbe (cited above) report the impact of domestic cats on native animals in urban Tucson, as compared with a "desert ranch" environment. They find that "since the native nocturnal rodents" are "gone from Tucson", cats primarily decimate the local lizard populations, secondarily birds. In contrast, in the desert ranch environment the nocturnal rodents form their primary prey, while they attack lizards and birds much less frequently there. Coyotes, meanwhile, prey enthusiastically on domestic cats, both in the urban and in the desert setting. These two authors appear to suggest that coyotes perform a considerable service in limiting the potential destructive impact of domestic cats on populations of small vertebrates in our region (though, except where coyotes enter the urban zones, cats have strong impact on both lizard and small rodent populations in our cities). In our rural areas of the San Pedro River Valley, feral cats are present but they appear not to survive long in the bush -- foxes, coyotes, and mountain lions tend to kill them in fairly short order. Domestic cats living closely around the many scattered homesteads however no doubt have significant local impacts on the small vertebrates mentioned above. Below, a wandering domestic (or feral?) 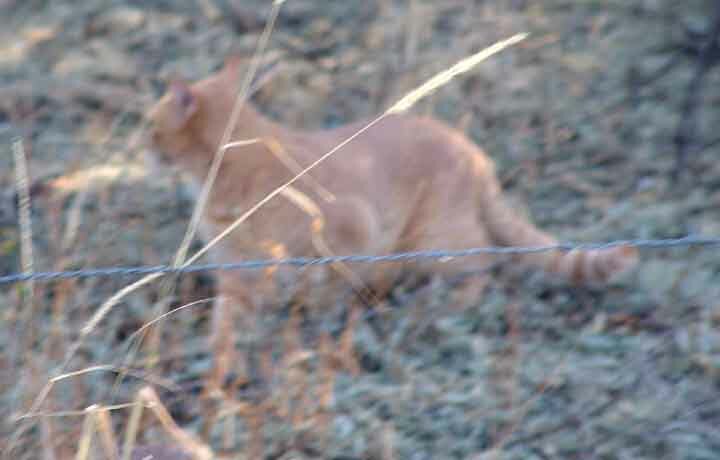 cat (another Orange Tabby) seen in January 2006 near Milepost 20 on the Cascabel Road.